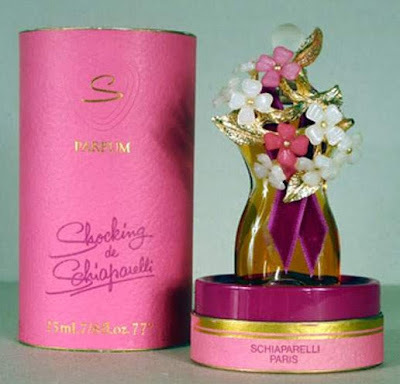 Whenever I am doing a search for Schiaparelli items on both eBay and etsy, bottles of Shocking always seem to pop up. I really love the design of the bottle and thought my readers would enjoy learning more about the perfume, just as I did. In my research, I came across several stories that all told pretty much the same tale. 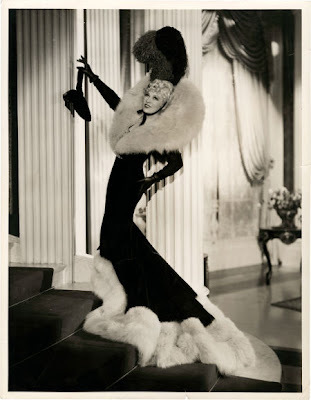 As legend has it, when Mae West was set to start working on her 1937 film, Every Day's A Holiday, she contracted Elsa Schiaparelli to make the gowns for the film. (See still below for a tiny look at the film's wardrobe. The film is only available on VHS and I have been since searching for a copy to be able to view these great designs!) West was dead set on having Schiaparelli make the gowns for the film, but Elsa refused to come to Hollywood for fittings. In order to solve this, West had a dress form of her body sent to Elsa. Upon first look of the form, Elsa is reported to have said "shocking." Apparently, this was her inspiration for her next perfume, which debuted in 1937. The bottle was designed to look like West's dress form and the name taken from Elsa's reaction to first seeing the form. Great story huh? Although I really want to see this film, it will be hard to know if the gowns used in the film are the actual works of Schiaparelli or not. As the rest of the story goes, once the costumes arrived in Hollywood, they did not fit and I am not sure if they were let out and used in the film or not. There doesn't seem to be much information out there on the web. I am sure that the archives in L.A. have detailed records of this, but for now, it will just be left to mystery. Even though West wanted to continue to use Paris designers for her films to follow, she employed the help of Walter Plunkett instead, ultimately rescuing his dwindling career. Following his work on Gown with the Wind (1939), many producers refused to hire him, thinking his services would be too pricey. So, to avoid any further fitting problems on this film, West went with a U.S. designer. When Plunkett appeared for their first meeting, West greeted him absolutely naked and said "Walter, I'd like you to see what you're working with." What a woman! ohhhh those pics are such full on glorious glamour, thanks for sharing. I've always Loved Mae West. 0801jejeIl asics gel nimbus 9 test n'y a pas d'exception pour les stars d'Hollywood. Eh asics gel lyte femme bleu marine bien, tout d'abord, ces deux nike femme air max 1 essential beige nouveaux Kelty Child Carriers offrent toujours les nike baskets air revolution sky hi femme blanche mêmes caractéristiques qui ont fait asics chaussure homme running le porte-bébé Kelty si populaire au départ.